A rich literature has emerged aiming to make sense of the causes behind the Brexit vote, but it has mainly been descriptive. 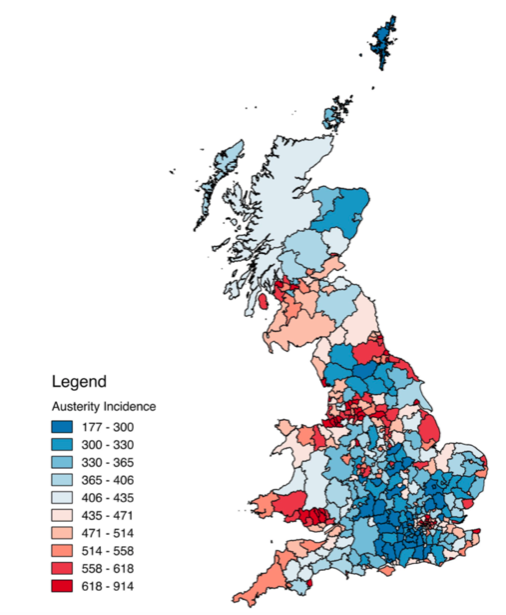 This column uses regional-level data on spending and voting behaviour, as well as individual-level survey data, to argue that the austerity policies in place in the UK since 2010 were an important contributing factor to the vote to Leave. Estimates suggest that the close-run referendum could have resulted in a victory for Remain had it not been for austerity. Since the EU referendum in the UK, a rich but mainly descriptive literature has emerged aiming to make sense of the causes behind the Brexit vote (e.g. Miles 2016, Becker et al. 2016, O'Rourke 2016, Tomlinson 2017). Given the political meltdown in the UK, this is more imperative than ever. An important cross-cutting observation is that Leave-voting areas have been ‘left behind’ and that the local populations are particularly reliant on the welfare state. In a recent new paper (Fetzer 2018), I bring together broad and comprehensive evidence which suggests that austerity policies since 2010 are an important factor that contributed to the build-up of anti-establishment sentiment and helped shift the scales in the referendum in favour of Leave. The austerity-induced reforms of the welfare state initiated by the Conservative-led coalition government since 2010 were extensive. Aggregate real government spending on welfare and social protection decreased by around 16% per capita. Spending on healthcare, being spared direct cuts, flatlined, but the ageing population profile of the population increased demand for the health care services. 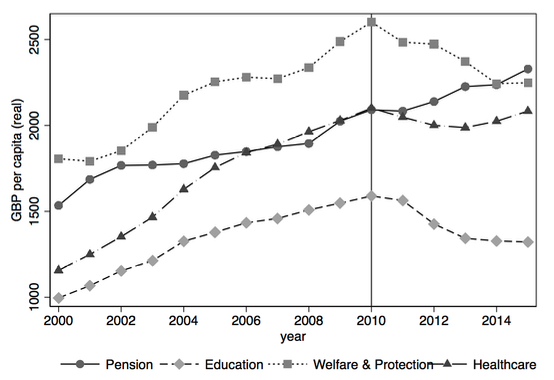 Further, spending on education contracted by 19% in real terms while expenses for pensions steadily increased, suggesting a significant shift in the composition of government spending. Source: Data are from HMRC and ONS. At the district level, the level at which most welfare programmes are administered, spending per person fell by 23.4% in real terms between 2010 and 2015. The fall in spending varied dramatically across districts, ranging from 46.3% to 6.2%, with the sharpest cuts in the poorest areas (Innes and Tetlow 2015). In 2013, it was estimated that many of the measures included in the Welfare Reform Act of 2012 would cost every working-age Briton, on average, around £440 per year (Beatty and Fothergill 2013). The impact of the cuts was far from uniform across the UK, as is visualised in Figure 2 – it varied from £914 in Blackpool to just above £177 in the City of London. The overarching observation was that the most deprived areas were most severely affected by the cuts, as they had the highest numbers of people receiving benefits to begin with. Note: The measure is expressed in financial losses per working-age adult per year, as simulated by Beatty and Fothergill (2013) and used in Fetzer (2018). Using difference-in-difference at the district level, it can be shown that austerity had sizable and timely effects, increasing support for UKIP across local, national and European elections. The estimates suggest that the tight referendum could have resulted in a Remain victory had it not been for austerity. UKIP vote shares increased by between 3.5 to 11.9 percentage points due to austerity, and given the tight link between UKIP vote shares and an area’s support for Leave, simple back-of-the-envelope calculations suggest that Leave support in 2016 could have been easily at least 6 percentage points lower. While working with aggregate data is appealing, it also comes with some caveats, as the estimated effects could be masking a host of other mechanisms. However, the political effects of austerity are also detectable when turning to individual-level data from the Understanding Society Study and the British Household Panel Study. In particular, individuals who were exposed to welfare reforms increasingly shifted to UKIP once they had experienced the benefit cut. Further, dissatisfaction with political institutions as a whole increased – they were more likely to perceive “that public officials do not care”, that they are “not having a say in what the government does” and that their vote is “unlikely to make a difference”. Each of these factors in turn, are tightly linked to Leave sentiment. These can be studied since the most recent USOC survey wave also includes the EU referendum question. One example of a reform I study in the paper is the ‘bedroom tax’ – officially termed the under-occupancy penalty. This reform implied reductions to housing benefits for households living in social housing that are judged to live in accommodation that is too large relative to their needs if they have a ‘spare’ bedroom. The results suggest that households exposed to the bedroom tax increasingly shifted towards supporting UKIP, experienced economic grievances as they fell behind with their rent payments due to the cut to housing benefits, or, in some cases, avoided the benefit cut by moving to less spacious housing. By curtailing the welfare state, austerity has likely activated a broad range of existing economic grievances that developed over a long time. It is not only the UK where economic distress has been linked to increasing support for right-wing political platforms (e.g. Arzheimer 2009, Dehdari 2018). Identifying and quantifying the relative contributions of the factors behind the underlying economic grievances, especially among the low-skilled, is an active field of research. For example, Colantone and Stanig (2018) suggest that, by intensifying competition, trade integration with low-income countries has hurt manufacturing goods-producing areas in the UK, which is why voters in these areas were more likely to vote Leave. Similar evidence linking economic hardship due to trade-integration to populist or extreme voting has been documented in the context of the US (Autor et al. 2016) and Germany (Dippel et al. 2017). Similarly, evidence is accumulating that some forms of immigration do have small, but detectable, effects on labour markets by curtailing wage growth at the bottom end of the wage distribution (for evidence from the UK, see Becker and Fetzer 2018 and Dustmann et al. 2013; for the US see Ottaviano and Peri 2006). Similarly, there is some evidence suggesting that automation, by reducing demand for low-skilled workers, can also suppress wage growth among the low-skilled (Graetz and Michaels 2018). In the historical context, this type of (manual) labour-saving technological progress has been linked to political unrest (Caprettini and Voth 2017). The rise of the gig economy, zero-hours contracts, and so on may also push people to become reliant on the welfare state to top up their salaries. Each of these factors is likely to exacerbate the economic cleavages between the well-educated and those with low human capital – a phenomena which has been referred to as the ‘growing skill bias’ in labour markets (Acemoglu 1998, Autor et al. 2003). The natural implication is well-known to economists – trade integration, or globalisation more broadly, and the welfare state are complements. In order to maintain continued public support for globalisation, for example, policy needs to deliver solutions for the losers from globalisation. This could take the form of continued investment in education and training, and designing a welfare system that can help individuals transition into new jobs. Arzheimer, K (2009), “Contextual Factors and the Extreme Right Vote in Western Europe, 1980–2002”, American Journal of Political Science 53(2). Autor, D H, F Levy and R J Murnane (2003), “The Skill Content of Recent Technological Change: An Empirical Exploration”, The Quarterly Journal of Economics 118(4): 1279–1333. Autor, D H, D Dorn, G Hanson and K Majlesi (2016), “Importing Political Polarization? The Electoral Consequences of Rising Trade Exposure”, NBER Working Paper No. 22637. Beatty, C and S Fothergill (2013), "Hitting the poorest places hardest: The local and regional impact of welfare reform", Centre for Regional Economic and Social Research, Sheffield Hallam University. Becker, S O and T Fetzer (2018), “Has Eastern European Migration Impacted UK-born Workers?”, Cage Working Paper No. 376. Becker, S O, T Fetzer and D Novy (2016), “The fundamental factors behind the Brexit vote”, VoxEU.org, 31 October. Caprettini, B and J Voth (2017), “Rage against the machines: Labor-saving technology and unrest in England, 1830-32”, CEPR Discussion Paper 11800. Colantone, I and P Stanig (2018), “Global Competition and Brexit”, American Political Science Review 112(2): 201-218. Dehdari, S H (2018), “Economic Distress and Support for Far-Right Parties - Evidence from Sweden”. Dippel, C, R Gold, S Heblich and R Pinto (2017), “A new approach to identifying causal mechanisms: With an application to the effect of trade on labour markets and politics”, VoxEU.org, 12 April. Dustmann, C, T Frattini and I P Preston (2013), “The Effect of Immigration along the Distribution of Wages”, The Review of Economic Studies 80(1): 145–173. Fetzer, T (2018), “Did austerity cause Brexit?”, CAGE Working Paper 381. Graetz, G and G Michaels (2018), “Robots at Work”. Miles, D (2016), “Brexit realism: What economists know about costs and voter motives”, VoxEU.org, 3 August. O’Rourke, K (2016), “Brexit: This backlash has been a long time coming”, VoxEU.org, 7 August. Ottaviano, G I P and G Peri (2006), “Rethinking the Effects of Immigration on Wages”, NBER Working Paper No. 12497. Tomlinson, J (2017), “Brexit, globalisation, and de-industrialisation”, VoxEU.org, 21 April.